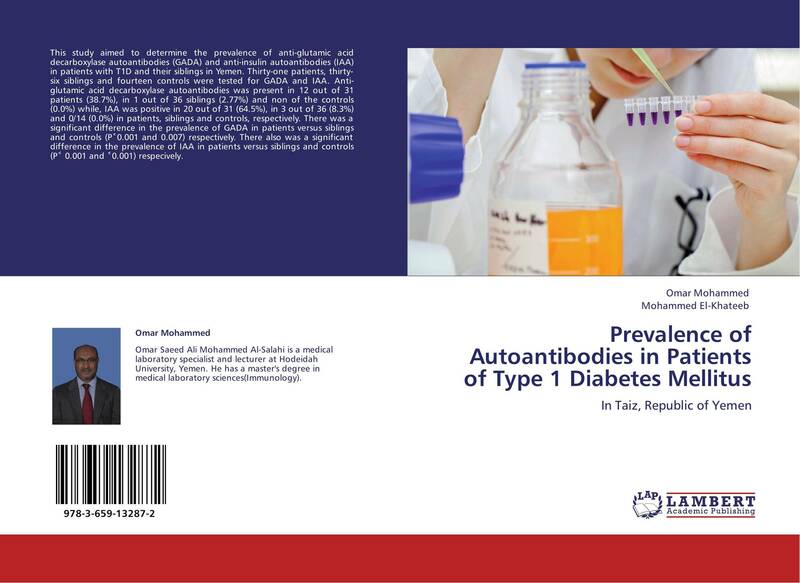 This study aimed to determine the prevalence of anti-glutamic acid decarboxylase autoantibodies (GADA) and anti-insulin autoantibodies (IAA) in patients with T1D and their siblings in Yemen. Thirty-one patients, thirty-six siblings and fourteen controls were tested for GADA and IAA. Anti-glutamic acid decarboxylase autoantibodies was present in 12 out of 31 patients (38.7%), in 1 out of 36 siblings (2.77%) and non of the controls (0.0%) while, IAA was positive in 20 out of 31 (64.5%), in 3 out of 36 (8.3%) and 0/14 (0.0%) in patients, siblings and controls, respectively. There was a significant difference in the prevalence of GADA in patients versus siblings and controls (P˂0.001 and 0.007) respectively. There also was a significant difference in the prevalence of IAA in patients versus siblings and controls (P˂ 0.001 and ˂0.001) respecively.